Are you looking for a simple SEO strategy that can help boost your rankings? Would you like to know how to generate a report listing your lowest hanging ‘SEO fruit’? If you have ever thought your SEO work was teetering on producing excellent results, then today you’ll be able to find out. Today I am going to show you how to pull a simple keyword report from Google Analytics. This report will tell you exactly where you rank for certain high traffic keyphrases. Click the view below to watch the simple SEO strategy live in action. Also, I’ll show you how you can get Google to send you this report weekly. Every Monday, for example, you can get Google to send you a report on your website that breaks it up into three different areas. I’ll show you three different areas you can grab your keyword reports for. Now, this is important from an SEO point of view and will help you prioritise your SEO strategy. It will help you laser focus your efforts when it comes to SEO to rank for particular key phrases. You will have to review your SEO content writing as well, but we’ll cover the on-page details below. I first learnt this strategy from Andy Crestodina. So let’s jump in and take a look at how to generate the reports and find out where your search queries are within the Google Analytics platform. At this stage, I am going to assume you have already setup Google analytics and installed the tracking code on your site. For this to work, you also need to have your website linked up to Google Search Console. Got both of those in place? Excellent. Let’s carry on then. Once logged in, left click on ‘Acquisition’ and then ‘Search Console’. From this menu, left click on ‘Queries’. You may want to change the timeframe, so you are viewing the last 30 days. If 30 days doesn’t give you enough information, then choose the last 90 days. Now you will see the keywords you are ranking for. For the purpose of this tutorial, it isn’t important what keywords this site ranks for. You will find the impression count is relevant when you are trying to find high volume search traffic. The number of impressions is a good clue to a key phrase that is getting some searches each month. You can left click on any of the headings to sort the column from highest to lowest or lowest to highest. Next, you will want to refine your search. This will allow you to highlight the critical information you need, rather than everything. Narrowing down the search criteria is important to see what you need to focus on. Left click on the word advanced. It will bring up the following search boxes. What you can do here is exclude and include various search queries or other elements. The first search you will want to do is find all those keywords and phrases where you are just outside the front page. In this case, it would be search queries outside the top 10. So change the first option to ‘Average Position’ and then select Greater than 10. Then hit apply. In this case, I am getting impressions from 687 keyphrases where I rank outside the top 10 positions. So page 2 onwards. You can see where it says 1-10 of 687. How do they calculate the ‘Average Position’? This is an excellent way to find those that you’re just not quite getting into the top 10. You’re outside the top 10, and you must try everything you can to push those pages to the front of Google. The ultimate goal is to drive your most important keywords to position 1 and secure the lion’s share of clicks to your website. Next, you want to find the pockets of opportunity. The low-hanging fruit so to speak. The best way to do this is to find those keyphrases with an abundance of impressions. You will notice in the screenshot below there are two key phrases with solid search impressions. Both 351 and 644. You can also see I rank on average in position 12 and position 15 in Google. This is a prime example of a keyphrase with substantial search volume and high impressions. If I could get to position one on Google, I’d likely triple my monthly traffic. Double check where in Google you rank for that key term. I recommend you do your search in incognito mode to get an accurate reflection of your Google position ranking. Find out which page your website is ranking for the search query. In theory, each of the terms you are looking for should be on page 2 of Google. We want to get the most trafficked keywords to rank on page 1. Now the SEO detective work starts. You are going to be analysing everything you can about this page relative to those on the front page of Google already. Is your keyword focus for the page aligned with what you now see as the dominant search query? You can use tools such as the Free SEO Toolbar by Moz. Is the main key phrase in the title? The title is quite an important part of SEO as it helps tell the search engines what the page is about. Consider rewording your Title to include the main keywords or a combination of your critical search terms. Your description is key to get the click. It also helps the search engines like Google discover what the page is about. Think of your description as the motivation to earn the click. When someone is typing into Google, the top 10 listings come up. Each appears with a short description. You will see from the screenshot below, the top 3 organic listings and their respective descriptions for SEO. Your description needs to be powerful enough to inspire the click. If you have a weak description, then you will be unlikely to earn the click. As a result, your click through rate (CTR) will go down, and Google will not feature you on the front page. The reason for this is your CTR is showing signs your messages are not aligning with the searchers’ intent. Next, you will need to review your content for SEO. Is your content congruent with the search query and your description? Are you using the main keyphrases in the first paragraph? Is your page informative and authoritative enough relative to your competitors ranking on page 1 of Google? This is where your SEO detective work comes in. You will need to review your page in terms of your on-page SEO and that of your competitors. As you can see, being able to highlight the keywords that aren’t quite on the front page is very handy. So you may want to run a few reports each month, so you have a couple of key SEO focus tasks. Find all those keywords ranking from position 11 to 30. Locate those keywords ranking from position 5 to 11. Grab the keywords ranking from position 50 to 100. There are three different focus groups of keywords which will be relevant at the various stages of your SEO focus. If you have an established site, you may want to concentrate on those ranking from position 5 to 10. In this case, you are on the front page, but an SEO boost from position 8 to 3 would mean a huge spike in traffic. If you recently launched your site, you may need a broader focus as you come up with content ideas. In this case, finding those key phrases where you rank in position 50 to 100 will be your best option. Some of you may have written a heap of blog posts over the last year and your site is more established. 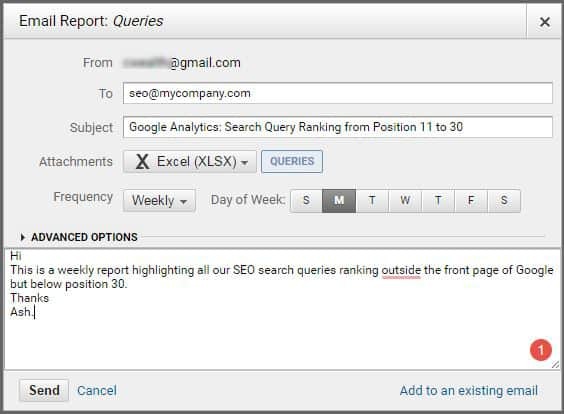 As a result, locating those from position 11 to 30 would be an ideal focus for SEO. To make your life easier, you can email a report to you and your team on each of these customised searches. Up the top of the analytics page, you will see the word email. Click on that as per the image below. Then fill in the report along the lines of the image below. You will then get a weekly report in excel format with your specific metrics. You could also select the report to be in PDF format too. It is entirely up to you. From a record-keeping point of view, this can be very handy to see the progress your SEO team is making. You can also use this report to guide your SEO team to create more focused content in areas you know will receive a huge boost in clicks, if you can get to page 1 of Google. These reports can also come in handy if you need information to convince your manager to allocate more budget to SEO. Keep in mind, SEO is more of a medium to long-term strategy. But when done correctly, it will mean a very high portion of your traffic is coming from organic search. If you found this post on a simple SEO strategy helpful, feel free to share it with those on your SEO team. Or if a friend is doing everything they can to rank their new website on the front page with no luck, then pass this along. It might provide a convenient focus for them going forward. If you are looking for an experienced SEO team dedicated to the financial services industry, then get in touch. We can discuss your goals and get clear on what you and your team would like to achieve going forward.